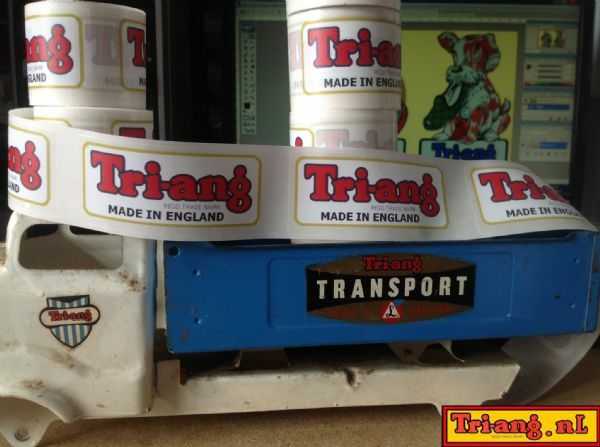 A set of 2 of the Larger Type " Tri-ang MADE IN ENGLAND " decals printed in Red and Black colours on a White background on "Clear material"
For example the "Tri-ang Junior Tipper" takes one of these on each side as do many more Tri-ang models. We print white ink on our printers and laser cut them out so you can apply these onto any Tri-ang Toy Colour. No messy old fashioned laser or inkjet waterslide decals just " Peel them off and stick them in place!" It's that easy. Tri-ang Junior Headboard finished in Blue with front and rear decals. Tri-ang Junior Headboard finished in Green with front and rear decals. Tri-ang Junior Headboard finished in Red with front and rear decals.